This installment of the Star Log.EM-series clocks in at 6 pages, 1 page front cover, 1 page editorial, 1.5 pages of SRD, leaving us with 2.5 pages of content, so let’s take a look! After a brief piece of text that provides a context for Lorefinders within the Xa-Osoro system, we are introduced to the lorefinder chronicler archetype. The archetype gains alternate class features at 2nd, 6th, 8th and 12th level. At 2nd level, we get “knack for knowledge”, which lets you choose 2 skills from a list. In these, you get a +1 insight bonus, add them to the list of class skills and may use them even untrained. The bonus increases by +1 at 6th level and every 4 levels thereafter , as well as at 20th level. If you gain an insight bonus from another class feature, you may roll twice and choose the better result, though only 1/day. You may do this an additional time per day for every time the bonus increases. This allows you to take the Extra Knowledge feat as an alternate class feature at 4th and 16th level. This archetype exclusive feat lets you choose two skills and gained the benefits of the aforementioned class feature, even if the skills usually aren’t on the list. At 6th level, the archetype nets “Epic Tales”, which doubles as the hurry envoy improvisation; if you already have it, you gain another one instead. Same goes for 9th level, where improved hurry is gained. The 12th level ability nets you 1/day summon creature (4th level) as a SP, getting to choose whether you’d do so as a technomancer or mystic. 16th and 20th level upgrade that to 5th and 6th spell level, respectively, and these also net new creatures. For 2 Resolve Points, you can use it an additional time, and if interrupted, the Resolve Points are lost. -Deep Pockets: Spend 1 hour to effectively distribute gear, increasing total bulk you can carry by 4, lasting until the next 8-hour break. -Live to Tell the Tale: 1/day attempt a new saving throw against ongoing conditions against which you failed a saving throw in a previous round, even if the effect would be permanent. This does not affect instantaneous or save-less conditions. You can spend 2 Resolve Points to add knack for knowledge to the result of the save. 6th level allows you to spend 1 Resolve Point to use this ability again after you used it that day. For 3 Resolve Points, you combine the two Resolve-fueled uses of this feat. -Swift Aid (Combat): use covering fire or harrying fire as a move action. You can also use either as a swift action by spending 1 Resolve Point, but multiple uses of this attack do not stack, but you can provoke one target with multiple bonuses against multiple, different opponents. This does expressively not reduce the action required for feats involving covering or harrying fire. Nice catch! 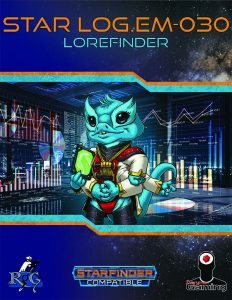 The pdf concludes with a nice piece of flavor text about lorefinders in the Xa-Osoro system. Editing and formatting are top-notch on a formal and rules-language level, I noticed no issues on a formal or rules-language level. Layout adheres to the series’ two-column full-color standard, and the artwork is nice. The pdf has no bookmarks, but needs none at this level. Alexander Augunas and Matt Banach present a rather cool adaptation of the Pathfinder Chronicler to SFRPG – I have no complaints here, and the archetype is actually more interesting than I expected it to be. My final verdict will clock in at 5 stars. You can get this fun supplement here on OBS!